We offer Deep Sea Reef fishing, Game Fishing, Ocean Cruises and Corporate functions. Join us on one of the charter trips to catch the following: Marlin, Yellow Fin, Snapper, Albacore, Kingfish, Jewfish and many more. We operate from Terrigal Haven which is just north of Sydney on the Central Coast of NSW. The business is owned and operated by Paul Minto since 1996 and we have a quality vessel, excellent safety standards, fully qualified and experienced crew along with a first class customer service. You don’t need a fishing licence when you fish with us as we have a block licence. 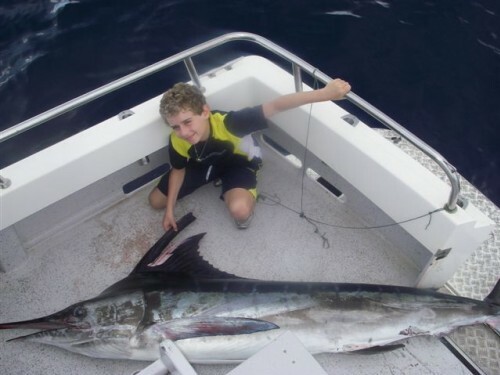 Reef fishing Charters – with Reef Fishing Charters we can offer all year round fishing. The fish caught are – Snapper, Jewfish (Mulloway), Mahi Mahi (Dolphin fish), Kingfish, Australian Salmon , Trevally , Blue Morwong (Deep Sea Bream) ,Tailor , Flathead ,Teraglin , Leather Jackets , Bream , Nannygai ,John Dory, Perch and Bonito. 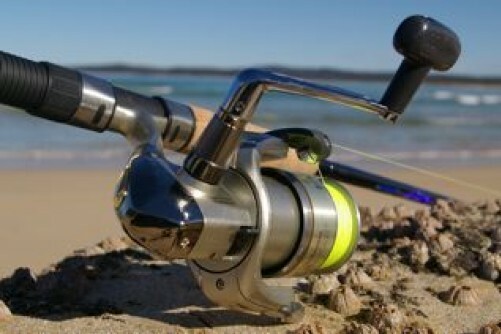 Fishing Equipment: Overhead fishing reels such TLD 15’s or Charter Specials from Shimano & custom rods. Bait: We use West Australian pilchards, squid & fresh caught bait fish. Fishing Equipment: LIGHT GAME TLD25 24kg Tiagra roller tipped , HEAVY GAME Tiagra 50W 24kg Tiagra fully rollered. Game Fishing Grounds: * Browns Mountain (south) which rises 600ft from the ocean floor to within 1200ft of the surface * Norah Head Canyons (north) is a series of rugged deep trenches in the ocean floor. * Vessel and crew are qualified to 30 N miles * The Continental Shelf is 23 N miles offshore. 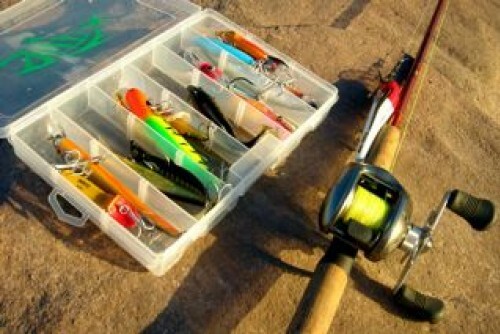 We also offer tournament fishing in NSWGFA Interclub at Port Stephens in February & March annually. Ask about charters for other competitions & locations. Maximum Passengers: 12 (10 for entrire boat) Reef. Game max is 6. Minimum Passengers: 5 (reef). 1 if you hire the whole boat. Inclusions: You catch them, we clean them, you keep them! Equipped with Shimano rods & reels Bait & tackle supplied. Complimentary morning tea, Rod holders and seating for each angler, Qualified/Certified Skipper & Crew on board Crew cut bait, clean and ice your fish. “SEA RUNNER” is manned by an experienced Skipper & Crew as required and is owned and captained by Paul Minto -Masters Class 5 – Marine Engine Driver Grade 3 and who has been fishing locally since 1987. Paul has also worked in the charter industry since 1994 and his own boat since 1996. 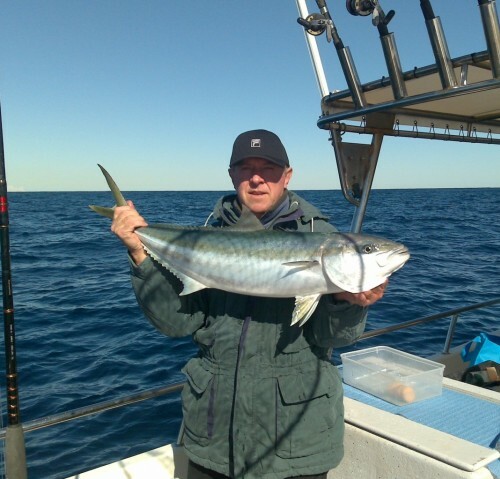 Paul has many years of fishing experience in the Terrigal area. He began in the charter industry as the 2nd boat for Central Coast Charters with Allan & Penny Ross until they moved to Coffs Harbour in 2007. Paul then continued on his own starting Central Coast Reef & Game Fishing Charters. With this local knowledge of fishing you get the edge to land that prize fish. Paul was also a former NSW Surf Life Saver and has a PADI Open Water Diver and First Aid Certificate. Our crew look after you! They are experienced, qualified and trained to provide first class customer service. They will also – Clean & ice your catch ready for you to take home, assist with fishing techniques, serve complimentary morning tea, Cut bait & rig lines and they all have first aid training & certificates. ‘Sea Runner’ – 36ft STEBERCRAFT Custom built Australian made Stebercraft – Comfortable fishing numbers 10, Comfortable cruise numbers 10, max 16. It is powered by Twin 250hp Iveco (Fiat) engines and can cruise at 16 to 17 knots Waterways survey permit # 21037 Charter Fishing Licence # CFB21037 Electronics – Colour Depth Sounder, GPS-Plotter, VHF & 27MG radios, Mobile phone. Other facilities include – Toilet, shower, fully equipped galley, seating on deck ,rod holder for each person , fish cleaning table, insulated fish & bait boxes, live bait tank, outriggers. Safety Equipment – we have all the normal safety equipment such as life jackets, life rafts, EPIRBS , flares, charts, flags, lights etc.